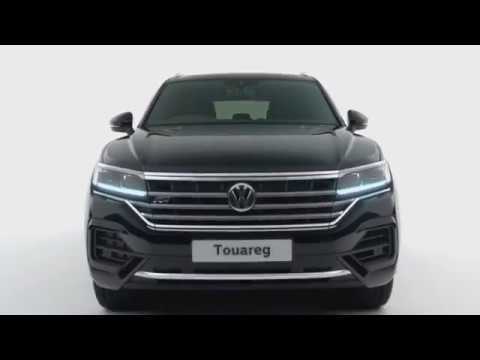 The new Volkswagen Touareg comes in an attractive, imposing yet sporty new shell. But there's plenty more going on inside the new SUV than meets the eye from the SEL, R-Line and range topping R-Line Tech trims. Wherever you look on the new Touareg you'll see strong design. From the longer bonnet designed to create an impressive silhouette, to the new LED lights which feature Dynamic Light Assist to provide more illumination without dazzling other road users. The new striking design doesn't stop there though, the swathes of chrome detailing which accent the bodywork sit on top of 19, 20 or 21 inch alloys and there's also an optional 'Off-road' package for those weekends when you're feeling extra adventurous. While the exterior of the new Touareg is all about athletic style and sporty intimidation, the interior takes you to a more relaxed destination. Through a combination of extremely spacious design and technological additions to make you feel as though you're floating down the road. The 14-way ergoComfort seats adjust electronically and if you're in need of a stress reliever after a long day at the office, the optional active front climate seats offer ventilation and a choice of 8 individual pneumatic massage settings. There are three 3.0-litre 6 cylinder diesel engines available for the new Touareg. All models benefit from 286ps, they're all able to get from 0-62mph in 6.1 seconds with a fuel consumption reading of 41.2mpg. The thee Touaregs also have the ability to take on more rugged terrain as they 4Motion technology comes as standard. In a first for Volkswagen, the new Touareg R-Line Tech will feature a mammoth 15 inch touchscreen screen infotainment centre which blends into the 12.3 inch digital display unit. This impressive technical arrangement allows the driver to control the Touareg's functions and systems with either touch, voice or gesture. ​A fully customizable home screen complete with all your favourite apps and photos turns the central interface into your phone screen for a safer, more intuitive and convenient drive. In the world of Volkswagen Group SUVs, the Touareg is actually the budget-friendly baby sibling. Its sister cars include – in ascending order – the Audi Q7, the Porsche Cayenne, the Lamborghini Urus and the Bentley Bentayga. That’s quite the family reputation to uphold. As the cheapest member of the group, the Touareg has stiff competition from cars such as the Land Rover Discovery. But its premium leanings bring it into the running as a rival to upmarket cars such as the BMW X5 or even its Audi Q7 sibling. The Touareg now sits on the same MLB Evo platform as its upmarket siblings, which brings a number of benefits for ride and handling, not to mention the cost saving in using a single, scalable platform for each car. It’s also significantly lighter than the outgoing model. The cockpit is where the Touareg’s new tech really shines, as it’s the first VW Group car to use the firm’s new ‘InnoVision’ dashboard. This merges the Virtual Cockpit digital dials virtually seamlessly into a massive, 15-inch touchscreen infotainment system. Though there’s likely to be more options coming – including a plug-in hybrid powertrain – from launch, buyers will more than likely choose the engine we have here. It’s a 3.0-litre V6 diesel unit producing 282bhp and a juicy 600Nm of torque. It’s mated to an eight-speed dual-clutch gearbox, with power sent through all four wheels. That translates to 0-60mph in 5.9 seconds with a top speed of 148mph possible. Despite the weight-saving, the Touareg is still a big, bulky, heavy vehicle, so that torque is appreciated. But the Touareg will be plenty fast enough for most buyers. Push the car hard and the engine’s throaty note is surprisingly pleasant to listen to – but this is a car best enjoyed at a more smooth and sedate pace. We suspect the ‘Sport’ mode switches will gather dust under most owners. As for efficiency, Volkswagen claims 40.9mpg on the combined cycle with CO2 emissions of 182g/km. This generation of Touareg has grown significantly in length and width but lost a few mm in height. The result looks planted on the road with less of an off-road focus than its predecessors. Up front, there’s a bold and upright chromed grille flanked by sophisticated LED headlamps lending a precise feel to the nose. In short, it’s handsome enough, with the body creases that characterise a modern VW. At the rear a simple tailgate and smart LED lights come together with the chrome details and tail-pipes to offer a strong all-round look. Though the car’s available in the usual black as well as deep red, blue and green shades, the lighter hues show off the details better. Volkswagen’s hard work is best seen in the interior, which is dominated by the brand’s ‘InnoVision’ cockpit. It melds the trademark ‘Virtual Cockpit’ with a 15-inch touchscreen infotainment display. The two give the illusion of being one giant screen across the whole car. On the whole, the mixture of the extremely roomy interior with the space-age look of the cockpit works very well. UK specs have yet to be finalised but you can expect the Touareg to come with all of the basics for its £49,000 starting price. Key tech – such as the air suspension, four-wheel steering, InnoVision cockpit and excellent Dynaudio sound system are likely to be optional extras, though, or require a step up from base trim. Stylish R-Line trim brings some glitz to the show – it’s the only trim that’s offered on the outgoing model, and is likely to be a popular choice among UK buyers. The new Touareg is a very convincing premium SUV and one that melds class-leading interior tech with good manners on road. It’s smart to look at, comfortable to ride in and showcases the best that VW has to offer.